I know what you’re thinking. Oh great, another Mexican-border drug cartel actioner — a sequel, yet. Just what we needed. There haven’t been nearly enough severed heads in plastic bags or loony, poetry-quoting drug lords in movies lately. If we’re lucky, somebody will have a man-eating Bengal tiger as a house pet, in a cage outfitted with Jeff Koons sculptures as its scratching posts. And there’s got to be a mansion that uses $100 bills for insulation. Fortunately, Sicario: Day of the Soldado does not reach that degree of clownishness. Far from it. As envisioned by screenwriter Taylor Sheridan (he wrote the original Sicario) and Italian move-over TV director Stefano Sollima (helmer of the cable version of Roberto Saviano’s Gomorrah), this further attempt to establish a franchise on the rugged mug of actor Benicio Del Toro is dark, dour, and depressing — everything a crime yarn from the United States-Mexican borderlands should be. The political implications of Sheridan and Sollima’s sequel outstrip even real-world events for ghastliness. In order to prevent the importation of mall-bombing terrorists into the US by Mexican drug cartels smuggling them across the border mixed in with ordinary refugees, the Secretary of Defense (Matthew Modine) orders the national security apparatus to undertake a secret mission. The spooks, led by federal asset Matt Graver (Josh Brolin), are instructed to kidnap the daughter of a prominent cartel boss in order to provoke a war between rival cartels. How this is going to directly restrict the flow of terrorists is not fully explained — especially when it is revealed in dialogue that the smuggled suicide bombers are actually from New Jersey. What follows is the invasion of Mexico by the United States, complete with helicopter gunships, armored personnel carriers, and platoons of black ops loaded with sophisticated assault weaponry. In what might as well be Donald Trump’s fantasy scenario, the yanqui invaders ride roughshod over the drug traffickers, responding federales, and bystanders they meet, treating Mexicans to the same aggressive style of take-no-prisoners policing practiced in the poorest stateside neighborhoods. At one point, 25 Mexican cops are gunned down by the gringos. No more need for a wall, apparently. While all this is going on, the subplots kick in. The most interesting scenario is the return of bedraggled mercenary Alejandro (Benicio Del Toro) to Graver’s team, joining fellow series holdover Brolin. The relationship between the cartel jefe’s teenage daughter Isabel (played by American actor Isabela Moner) and the enigmatic Alejandro gives the film some needed down-to-earth interpersonal contact amidst the firefights. Their story runs parallel to the secret mission, along with a third thread involving Miguel (Elijah Rodriguez), a young would-be coyote from the American side of the border. Alejandro, Isabel, and Miguel are presented as essentially innocent — if we can believe that a hit man, a spoiled brat who lives in her own 30-room house, and a kid who could shoot a bound-and-hooded victim in the head are somehow innocent. As with the original film, the characters’ motives are intricately entangled in the procedural business. Plot twists multiply. At times it’s difficult to separate the good guys from the bad guys. Based on Sheridan’s previous screenplays, that confusion is intentional. Sheridan’s Hell or High Water, one of the best films of 2016, floated provocative subtexts of its own in the story of a pair of bank-robbing brothers getting even with predatory financial institutions. The Texas Rangers chasing the brothers grudgingly sympathize with them even while hunting them down. That ambiguity is reprised in Sicario: Day of the Soldado. The warlike mentality of Graver and his Pentagon bosses runs contrary to the instincts of loner-killer-savior Alejandro, a man who takes the bosses’ money in return for his bloody work but lives to regret it. Alejandro’s dilemma — mixed in with blood, saliva, and dust — is engraved on Del Toro’s face in the movie’s last quarter. 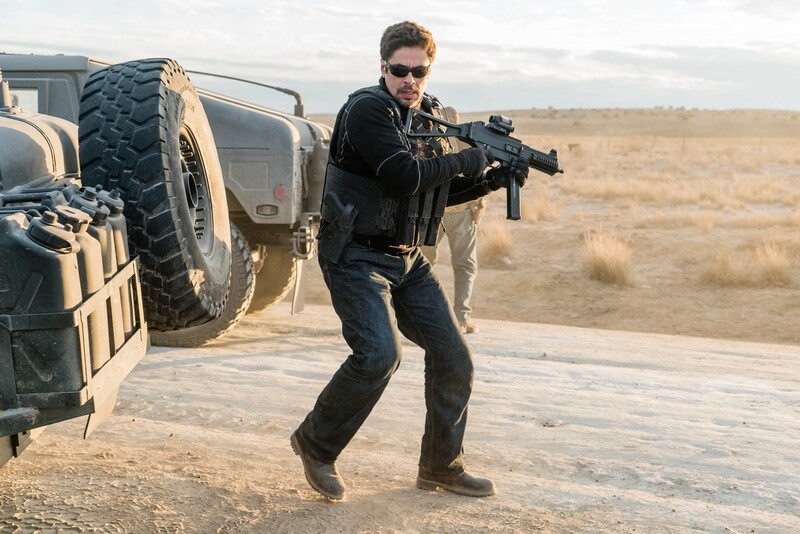 This Sicario may have more talking points than it can comfortably hold. It’s often confusing, and its political irony is thick enough to slow the story down in spots. But it’ll make you squirm.